What is conscious sedation dentistry? Contrary to its common name of “Sleep Dentistry”, you are not fully asleep. Conscious sedation uses a combination of medicines that allow you to enter a state of relaxation while still being awake. You won’t feel pain, but you will still be able to respond to your dentist’s questions and instructions. This an excellent option for fearful dental patients. 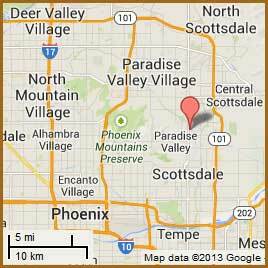 Scottsdale is a beautiful location it is a resort town. It is only 10 to 12 minutes from the airport. It is a town that has 300 days of Sun out of the year and the bluest skies you can imagine. We have golf courses, and resorts throughout. Your entire treatment should take no more than one or two days with that you can combine it with a destination location enjoy a great time to have fun and recuperate and also take care of your dental needs.